The nationwide observance of the International Women’s Day held on March 8,2019 at SDO, Conference Hall empowered the Schools Division Office – Personnel. Focusing on the theme, “We make change work for women.”Mr Edgar S.Teovisio, the founding president and chief HR/Od consultant of Confluent Learning Career Development Inc. and the author of the “8 Streams of Confluent Learning to Personal Effectiveness” shared his expertise and brilliance as the Resource Speaker. 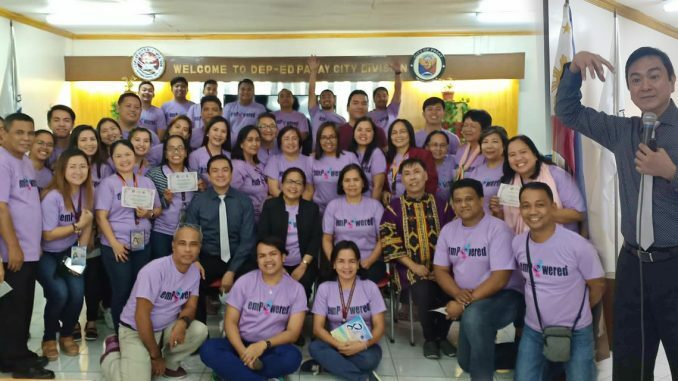 The training dubbed as Unleash: Celebration of National Women’s Month (Advocacy Campaign) which was presented in three modules engaged the participants with the fun-filled activities and insightful learnings. The provision of Confluent Learning /Personal Empowerment Action Kits have drawn the participants’ attentions. The training provided the participants with thorough understanding on the generation gaps in the workplace, ideas on getting the best generation diversity and harnessing holistic personal effectiveness on personal empowerment. In one of his inputs, Teovisio said that the best results come from everyone in itself, in doing good and in sharing that goodness to others and to the organization that brings out the best results. Coupled with right attitude in the workplace and the self-reflection of one’s traits define the important roles of personnel in the organization, he concluded. Meanwhile, the two-day Gender and Development responsive activities on Harmonized GAD Guidelines and celebration of Women’s Month ’Empowering Men and Women Through the Implementation of Programs, Projects and Activities of SDOP Implementers and Developers held on March 7-8,2019 respectively are in support to Proclamation No.224 s,1988 declaring the first week of March as Women’s Month.